Water diffuses light, so you’ll need to use brighter lights than you expect. Once you’ve decided on the wattage/Kelvin you’d like to use, pick out submersible lights that are about ⅓ to ½ brighter. This will help you produce the desired effect. If your water fixture’s casing gets water inside it, it will likely destroy the fixture. You should always opt for high-quality lights when choosing submersible lighting. Solid brass light fixtures are the best option for your underwater lights. If your pond is a fish pond, you should be careful not to create a harmful environment for the fish. Always pay attention to how much heat the underwater lights give off and make sure that it won’t be too much for your fish. In addition, you should never light up the entire pond. You need to provide the fish with a dark place where they feel safe to sleep or hide when they get spooked. Pointing downlights at a pond will cast a subtle, diffused glow on the pond’s surface. It will make the pond eye-catching even from a distance. If you want to downlight a pond, it’s best to angle the lights and use cooler (lower Kelvin) lights. To really bring attention to a pond from afar, aim spotlights across the water’s surface. This will create a beautiful reflecting effect. It’s best to slightly angle these lights at the pond in order to properly create the reflections on the water’s surface. To highlight a waterfall, uplights are the best. They will make the waterfall visible, and the water will diffuse the light to create a beautiful effect. You can even use colored lights to create an even more stunning effect. Just remember that – just like with underwater lights – you’ll want to use brighter lights than you’d expect. If you have a fountain or bubbler in your pool or pond, submersible uplights are the best kind of lights to use. Just as with a waterfall, they’ll highlight the water feature and create a beautiful diffused effect. Furthermore, you can use colored lights, and you’ll need to use very bright lights. Submersible lights will draw attention to a stand-alone fountain. Cooler lights in the water will create a nice subtle effect in this water feature. You can also use spotlights to draw attention to the fountain. No matter what kind of water feature you’re trying to light up, you won’t create the desired effect if the lights are not positioned correctly. You can use a flashlight to help you determine what the correct angle might be, or you can just use a trial-and-error method. 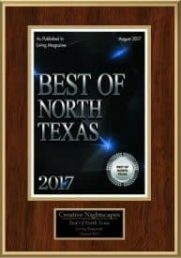 If you want to light up a stand-alone fountain or waterfall, or you want to light up your pool and deck with exterior lighting, contact Creative Nightscapes. 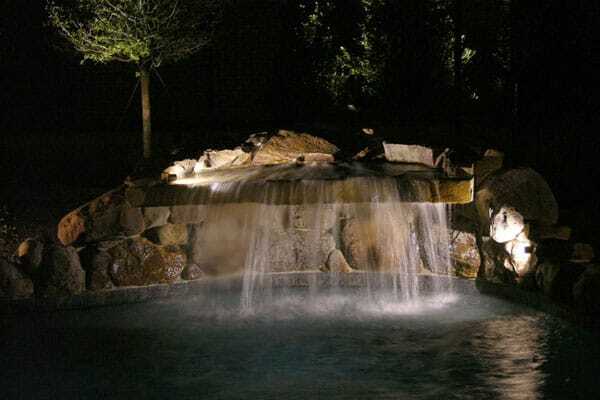 They can install poolside lighting, spotlights, uplights, downlights, and a variety of other kinds of lighting that will highlight the best features of your landscape. Contact them today to learn more about their outdoor lighting services.